2.In a large bowl mash the bananas with the oil, applesauce, vanilla, cinnamon & salt. 3. 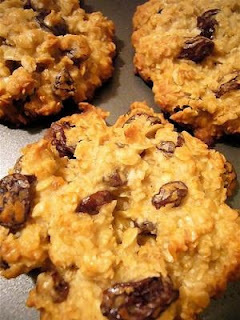 Add coconut, almond meal, flax seed, walnuts, chocolate chips and oats. Stir to combine. 4. Drop spoonfuls of dough onto a cookie sheet. Bake for 15-20 minutes. I made this for breakfast this morning. This is the before picture (not yet baked). After smelling this delicious creation for 40 minutes my family was too impatient to eat for me to get an after picture. It was one of those things that smells so good it's like torture having to wait for it to finish baking. It was so tasty we ate the whole thing! Oink! 2. 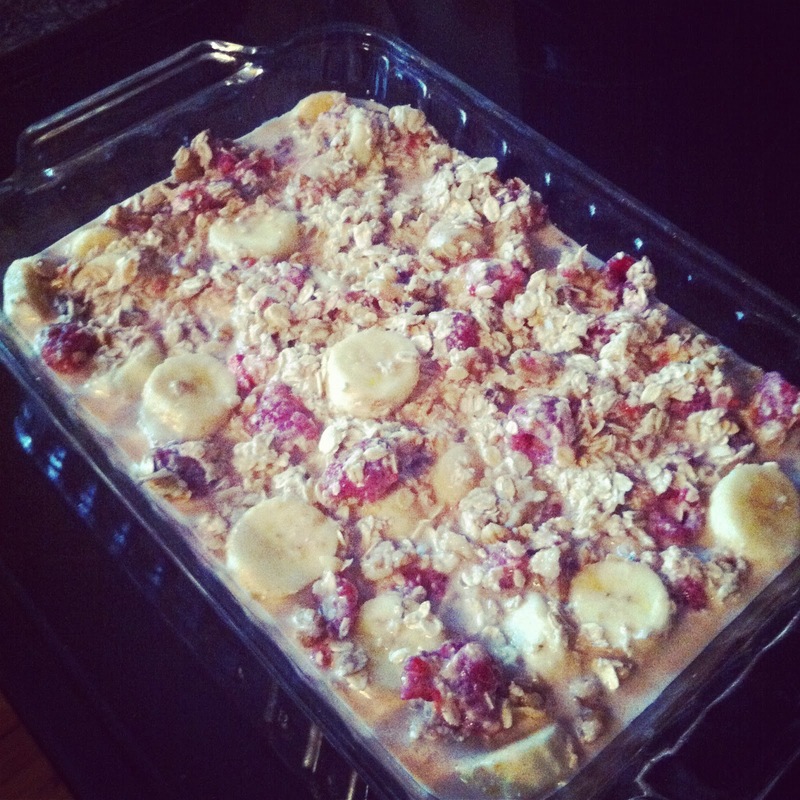 In a large bowl, combine oats, sugar, walnuts, berries, banana, cinnamon & salt. 3. In a small bowl, combine vanilla, flax egg & almond milk. 4. Gently add wet ingredients to dry ingredients. Pour into a greased casserole dish. 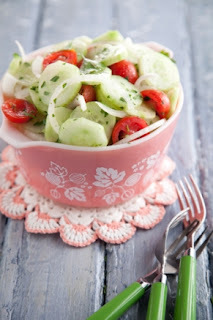 Thank you Paula Deen for helping me consume the large quantities of cucumbers and tomatoes from my garden! 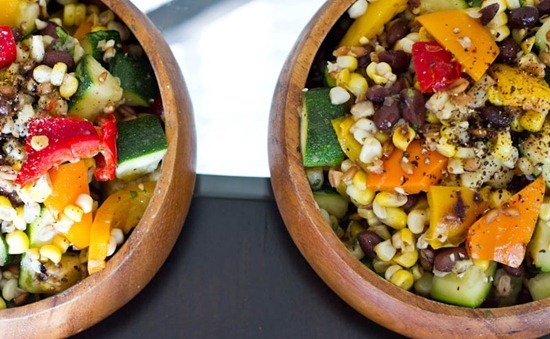 You can eat this salad immediately, or make it ahead of time. 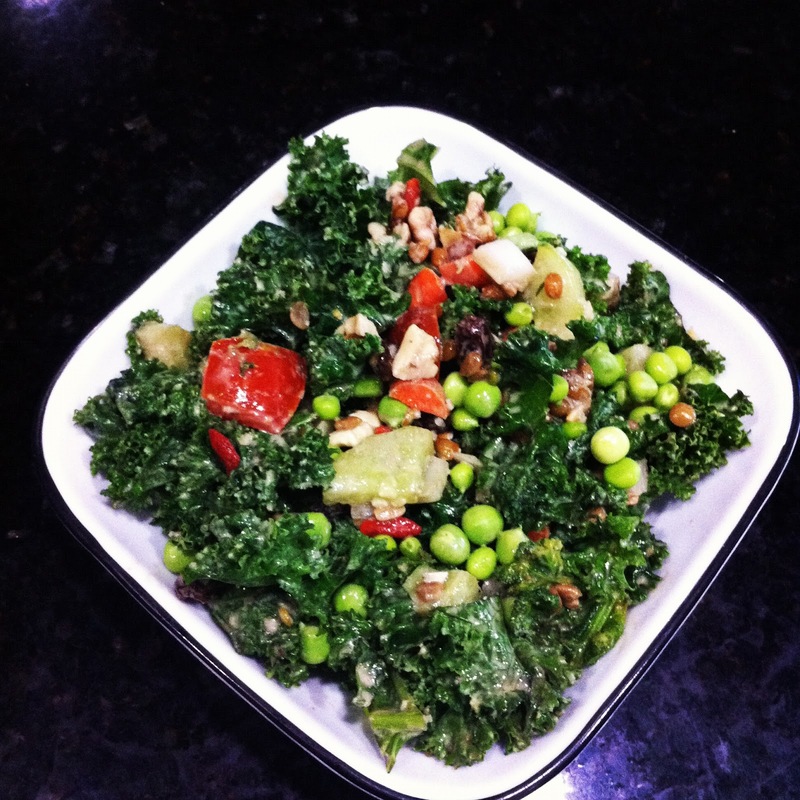 We made this delicious salad for lunch today from Green Lite Bites. Reminds me of a lighter version of a caprese salad, since it doesn't have all the cheese. 1. 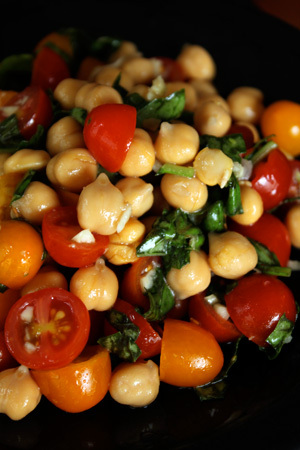 In a large bowl, combine chickpeas, tomato & basil. 2. In a smaller bowl, make the dressing by combining the garlic, vinegars, oil, honey & salt. 3. Toss salad with dressing and let sit for at least 5 minutes. 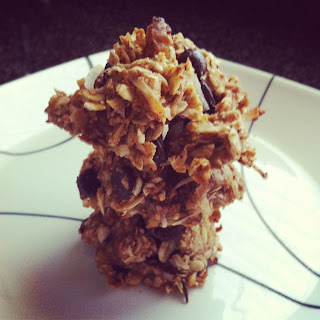 Another yummy recipe from Oh She Glows. I omitted the raisins from her original recipe. 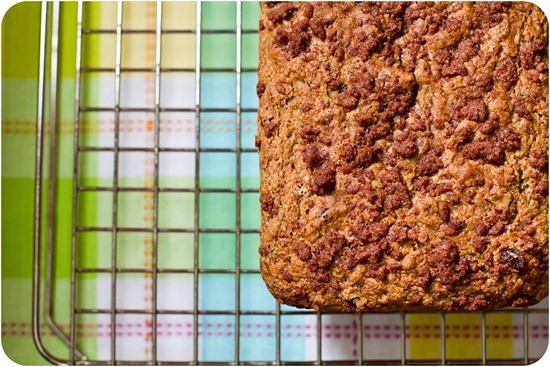 Just doesn't seem like raisins belong in zucchini bread. This bread is incredibly moist even though it has no oil. And not too sweet, just the way I like. 1. Preheat oven to 375 degrees. Mix flax egg & set aside. 2. In a stand mixer, combine dry ingredients: flour, baking powder & soda, salt, cinnamon & sugar. 3. In a separate bowl, combine wet ingredients: flax egg, lemon zest & juice, maple syrup & milk. 4. Add wet to dry and mix until just incorporated. Add zucchini and walnuts and stir just a bit more. 5. Place batter in a well greased loaf pan. 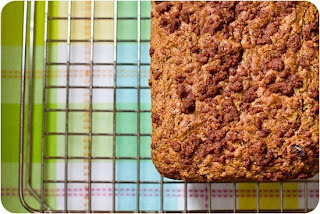 Combine streusel topping and sprinkle on top. 6. Bake for 40-50 minutes until a toothpick comes out clean. In my quest to find healthy, vegan recipes for my family, I knew that I would have to find a suitable potsticker substitute. My kids love potstickers. So much in fact, that my two-year-old can eat seven or eight in a single sitting. My five-year-old said that they were the "best he's ever had." I think his hunger helped them taste better, but I have to say that I was pleasantly surprised. It is important that you follow step 4 in the directions. The secret to a potsticker that stays together, and doesn't open up while you cook it, is that the filling cannot be too wet. Too much moisture and your dumpling will fall apart before you can take a bite. 1. Wash, chop, prep all your veggies. 2. In a large pan, heat sesame and canola oil. Add carrot & mushroom and cook for a couple minutes. 3. Next add tofu, zucchini, garlic, ginger, tamari, rice vinegar, agave & salt. Cook until tofu is warmed through. 4. Last, add bean sprouts, green onion & chive. Turn off heat and drain in a fine mesh colander. 5. Wet the edges of your potsticker wrapper with water, put a spoonful of filling in the middle and press the edges closed firmly. 6. Heat a little more canola oil in a skillet (make sure it's one with a lid) over medium heat. When the oil is hot, add the potstickers and cook until one side is golden brown. Flip them over, add a few drops of water (literally just a few drops or they'll be soggy), and cover with a lid and steam until the other side is brown too. I'm always looking for good new breakfast recipes. It's my kids favorite meal of the day. 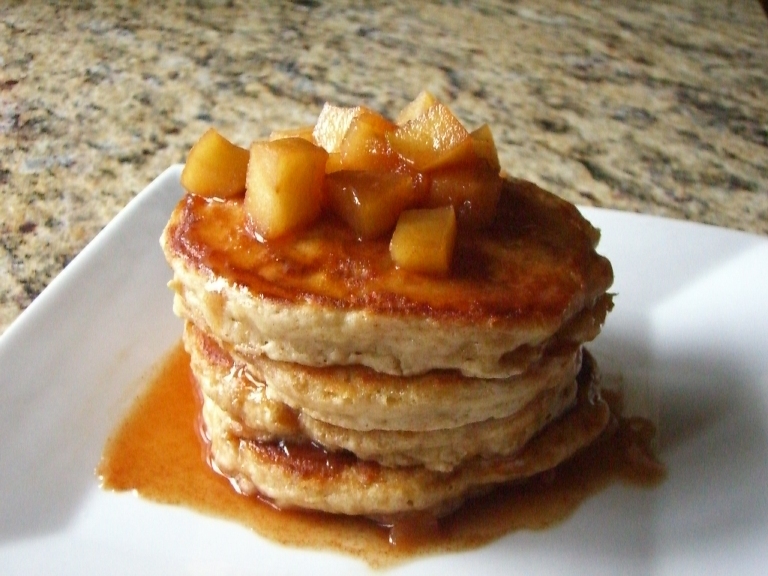 After my husband tasted these pancakes his exact words were, "Mmmm, these are blog worthy!" I think you'll agree. 1. Combine the dry ingredients. 2. Add the soy milk, vanilla & apples. 3. Stir until just combined. 4. Cook on a hot griddle or pan. Serve with maple syrup. 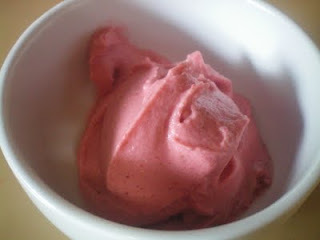 I made this yummy (not to mention healthy) ice cream for some friends a few nights ago. It was so much better than the plain banana version I've seen going around Pinterest. I tripled the recipe to feed 5 adults and 4 kids. 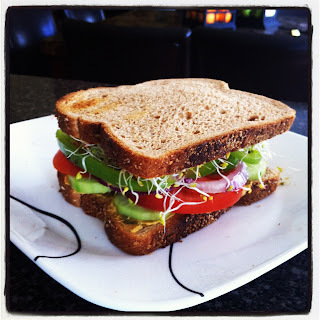 The recipe came from The Primal Home. 1. Combine all ingredients in a food processor and blend until smooth. 2. Keep adding coconut milk until it starts to blend well and come together. Add one tablespoon at a time, being careful not to add too much. 2. Mix all ingredients together and drop by spoonfuls onto a cookie sheet. Fluffy, melt in your mouth pancakes! These are in fierce competition for my favorite pancake recipe. They are delicious cooked with some chopped fruit mixed into the batter too! 1. Combine dry ingredients: flours, baking powder, soda, cinnamon, sugar & salt. 2. In a separate bowl combine wet ingredients: yogurt, buttermilk, eggs & vanilla. 3. Cook on a hot griddle and try not to eat the whole batch. They are seriously that good!